Everything you need to know about what makes your green sticky icky. Trichomes are the frost on your buds and the resin from which all your favourite Hash, BHO, Shatter and Wax are made. We zoom in on the importance of trichomes to cannabis plants, ganja farmers, and both medicinal and recreational users. The word trichome is derived from the Greek word “Tríchōma”, which translates as “growth of hair”. As they are microscopic, you really need to zoom in on the frosty blanket of resin, that coats high-grade cannabis buds to see the fields of trichomes, that resemble masses of stalks with tiny mushroom heads. But be cautious, a big crowd of trichomes doesn’t guarantee the weed is “loud”. Merriam-Webster’s dictionary defines a trichome as “a filamentous outgrowth; especially: An epidermal hair structure on a plant”. Botanical comparison of trichomes with hair can lead to confusion with the pistils, that are obviously visible to the naked eye as the hair-like strands protruding from calyxes of flowering female marijuana plants. Cannabis trichomes deserve a more specific stoner-friendly definition, an explanation of their functions and overall importance. We shall endeavour to bring you clarity. In our opinion, it’s best to consider trichomes as minuscule biological cannabinoid factories found predominantly on the flowers and sugar leaves of weed. Quite simply it’s the THC-rich trichomes, that get you high and the CBD-rich trichomes that make the best medicine. It’s number 3, the capitate-stalked variety, that’s of interest to weed lovers because they are the largest at 50-100µm wide and produce the oily medicinal/recreational goodies. WHAT’S THE PURPOSE OF TRICHOMES? In nature, it is believed, that trichomes facilitate quite a few essential to survival functions of the cannabis plant. The gooey surface coating of sticky resin provides a frontline defence against fungus, insects and hungry herbivores. Some flies and certain fungi cannot penetrate the trichome barrier, while terpenes will foul the flavour of the lettuce for four-legged furry critters. Furthermore, trichomes may also play a key role for cannabis growing in difficult climatic conditions. A layer of resin offers wild weed protection against damaging winds from the desert sirocco to the Siberian blizzard. Trichomes even serve as organic sun block for marijuana plants, protecting them from the effects of UV rays from the sun. We shall explore the relationship between UV and trichomes a little further below. 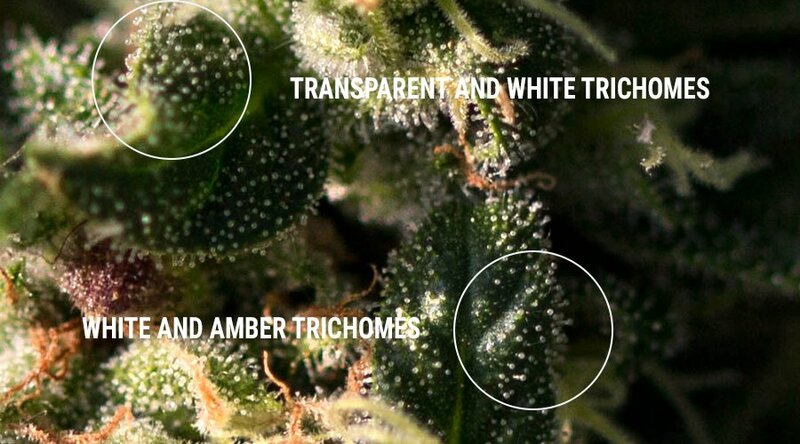 WHY ARE TRICHOMES IMPORTANT TO THE CANNABIS CULTIVATOR? We absolutely cannot emphasise the importance of trichomes to the cannabis cultivator enough. It’s a fact, the resin really is everything. Trichomes are the tiny factories dedicated to the manufacture of cannabinoids and terpenes. Potency, flavour and odour are inextricably linked to the process going on in the cells of the mini-mushroom heads. Cannabinoids are the compounds like THC and CBD, that give marijuana its mind and body effects respectively. Terpenes are “unsaturated hydrocarbons” or flavour makers, that give bud from different strains differing scents and tastes. Trichomes are the microscopic super structures, that house the essence of the psychoactive properties of cannabis. They can also assist a grower when it comes to judging the optimal time to harvest your weed crop. By monitoring the change in colour of the resin heads, either with a camera or microscope, the grower can best evaluate the ripeness of flowering female plants. In early to middle flowering, resin heads will be mostly clear. During the final phase of the bloom cycle, the grower will observe the transitioning of the clear mushroom heads to a milky white colour and eventually to amber. Most seasoned growers will shoot for a blend of milky and amber trichomes as the precise moment to harvest. 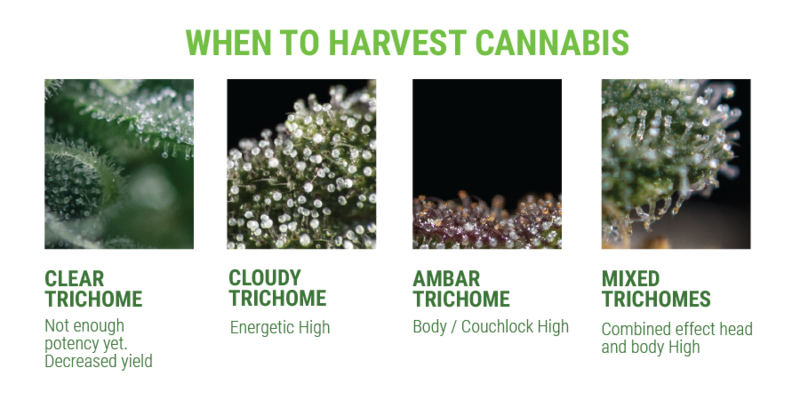 Sure, many other factors play a role when a grower is assessing the maturity of flowers, but we recommend you let the trichomes be your guide to preventing against harvesting too early or too late. Look out for those snow caps. The relationship between trichomes and light is the key to understanding the immense importance of trichomes. UV light is what gives dank weed the X-factor. Cannabis plants feed on light and when they receive the optimal spectrum they perform best. Old school outdoor cultivator’s anecdotes about HID cultivated indoor weed lacking sometimes in flavour and in potency have been confirmed by modern science. Trichomes respond positively to UV rays and it is now believed, that UV light is required for the trichomes to produce certain terpenes and cannabinoids. Modern LED lighting systems seem to be bridging the gap as they are specifically designed to emit the optimal spectrum of light for cannabis plants and they do it more efficiently than HID lights. At this point, you are probably already making the connection between trichomes and extracts and you’re absolutely right. OK, so we have confirmed, that a healthy coat of resin is responsible for the finer attributes of cannabis. Trichomes are the building blocks of all kinds of wonderfully potent concentrates and hashish. Everything from the hand rubbed Charras of the Indian subcontinent to Colorado’s Charlotte’s Web CBD medicine comes from resin. The method of extraction may vary from Moroccan sieving of plant material and then pressing, to butane gas derived hash oil, that can be whipped into “budder” on a low heat. 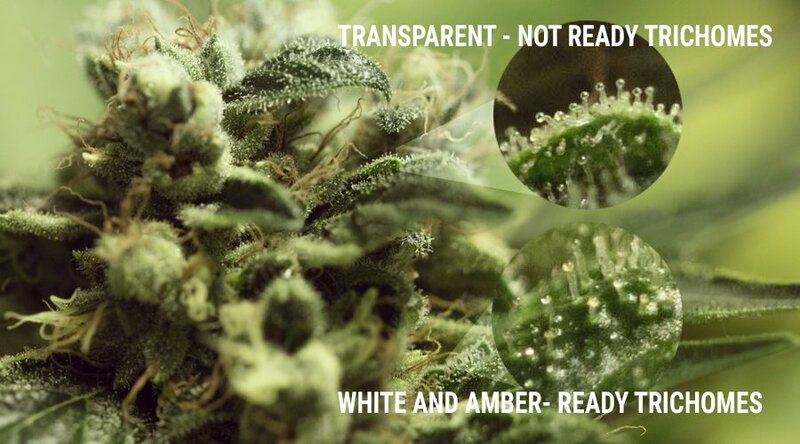 The raw material is always trichomes and they can easily be separated from the green material. Sometimes all too easily and not by intention, so remember to handle buds and colas with care, because resin heads are easily snapped off and dried bud can degrade rapidly if improperly stored. Concentrates have the additional huge benefit of an indefinite shelf life. Trichomes are not everything when it comes to cannabis, but they definitely are the most important thing. The rise of dabbing amongst millennial stoners and the international legalisation of medicinal CBD products means trichomes have never been so important cannabis culture. The Green Revolution is no longer tied to smoking sticky green. Knowledge of trichomes opens the doors to cannabis cuisine, awesome concentrates, tinctures, a plethora of medicines and new amazing discoveries yet to be made.